Three goals, two red cards and one decisive champion-to-be in Italy. 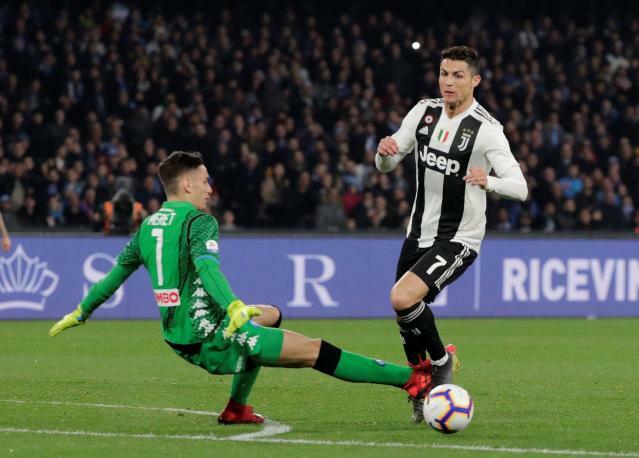 Juventus beat Napoli 2-1 at the San Paolo Stadium to extend its lead atop Serie A to 16 points, and both sides finished with 10 men in the volatile clash. Cristiano Ronaldo broke away from the defense in the 25th minute and forced Napoli goalkeeper Alex Meret to come out and meet him. Meret’s sliding challenge was a tad reckless and deserved a card, but Ronaldo’s uncharacteristically heavy touch took the ball away from goal and it seemed he ended up writhing on the ground when replays showed there was minimal contact, if any. It seems like a shot the wall should have stopped, but once the ball cleared Ospina had little chance of stopping it. About 15 minutes later, Jose Callejon cut the lead in half, finishing high after a cross by Lorenzo Insigne, and Insigne himself had a chance to tie the game in the 81st minute after Alex Sandro handled the ball in the box. But Insigne stung the post with his kick, and Juventus held on from there. For all the excitement, even a Napoli win wouldn’t have drummed up a ton of drama in the title race. Juventus still would have been 10 points clear, with Champions League distraction arguably a greater opponent than any side remaining on the domestic schedule. In the 13th minute, the match paused as both clubs and fans in attendance applauded the memory of Davide Astori, the former Fiorentina midfielder who died March 4, 2018, of cardiac arrest at 31 years old. Astori wore No. 13 and Serie A announced all clubs would honor him as part of this weekend’s fixtures.